Last week, the Chronicle of Higher Education featured a piece by Steven Brint arguing that we are in a golden age for higher education. 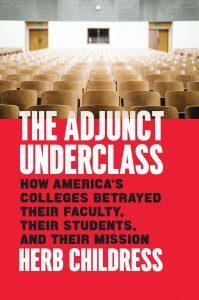 Herb Childress, the author of our forthcoming book The Adjunct Underclass: How America’s Colleges Betrayed Their Faculty, Their Students, and Their Mission, respectfully disagrees. We invited him to lay out his differences with Brint in the essay below. A particularly vexing form of disagreement arises when multiple observers see the same phenomena, but their vantage points lead them to describe them differently from each other. This is the position I find myself in after reading Steven Brint’s nicely researched, factually accurate article “Is This Higher Education’s Golden Age?” (Chronicle Review, January 11, 2019). I take no issue at all with what he says, but the things he sees aren’t the same thing I see, because we’re standing in different places. In overview, Brint’s article makes three basic claims. First, the enterprise of higher education is larger than it has ever been, when measured across a broad array of financial and participatory indices. Second, the rapidly increasing cost of the product hasn’t kept an increasing proportion of Americans from buying it (and in the case of graduate degrees, being repeat customers). And third, the growth of higher education has had important and broad-based ancillary effects on American society and economics. I concede all of this, just as I concede that exactly those same arguments could be made on behalf of social media and the military-industrial complex and the healthcare industry, with exactly my same ambivalence about it all. Let’s take a look at some of Professor Brint’s evidence of our golden age moment in greater detail. First, he begins by pointing to the vast growth in students, both in raw numbers and in proportion of the population. This growth, he argues, is due to the broad social recognition of the “college wage premium,” and he cites the 2015 Georgetown study showing college graduates averaging a million dollars more in lifetime earnings than high school grads. But that’s a misstatement of conditions on the ground. It’s not that college gets you a good job; the average wage for college degree holders has been relatively flat for thirty years. Instead, it’s that the lack of college sets you up to have a terrible job, or no job at all. College has become a form of indispensable employment insurance, available for purchase at protection levels from community college bronze to Ivy League platinum. Students and parents, more than policymakers or college leaders, better understand the real fact of the matter: both the wages and proportion of jobs available to high-school grads have plummeted in recent decades. This is due in part to the overall increase of college grads, so many that they are now forced to take jobs once occupied by high-school grads. The college wage premium would more accurately be phrased as the “college wage defense,” the credential that acts as a life raft in dangerous waters. It’s no surprise that everybody wants one; the alternative is life-threatening. The college wage premium is also misleading because any aggregation of outcomes masks a wide disparity of individual realities. A student from a well-to-do family getting her degree in public policy from Columbia University at age 22 and staying in New York City is going to have different financial outcomes than a single mother getting her degree in early childhood education from Ferris State University at age 35 and staying in Big Rapids, Michigan. The national average starting wage for college grads might be $50,000, but the specifics will vary wildly. Professor Brint also points to the vast increases in participation in graduate education as unalloyed positives, with both master’s degrees and doctoral/professional degrees tripling in annual production since 1970. This higher production is unquestionably good for the business of higher education, but is it good for its consumers? The production of PhDs has certainly not been matched by demand, as we see from the hundreds of thousands of desperate adjuncts and the frantic search for the gratifying “alt-career” now that the employment doors of academia are closed. Brint’s own 1982 PhD from Harvard, launched into the voracious university growth of the 1980s, was a circumstance somewhat unlike that of his current doctoral candidates from UC Riverside set loose into the contemporary academic employment desert. The master’s degree, accounting for a vast groundswell of new programs in the last decade, can also be read as a cynical attempt to have something to sell in the post-2010 trough of undergraduate-aged customers. The master’s degree is largely a product that built its own demand, the crossover SUVs and 4WD pickups of the academic showroom—overpowered and expensive tools that not many people really need, but which have increasingly become the norm of consumption now that a college degree alone isn’t enough to set one apart in the marketplace. There’s a reason why all those state colleges are now state universities, but it may not be an especially admirable reason. Professor Brint also points to the doubling of the faculty since 1995, quickly eliding its underlying cause: “A large part of this growth is due to the rapid increase in part-time faculty from 1999 to 2011, though since 2011 the number of full-time faculty has continued to grow, while the number of part-time faculty has shrunk by 4 percent.” Let’s be more forthright about this: the doubling has occurred because the faculty, nationwide, is now majority part-time. And as the undergraduate enterprise has shrunk in the past decade, higher education has responded by sloughing off its most vulnerable, most contingent members with no regrets, retaining the permanent faculty to teach those undergrads who remain, along with all of those more advanced graduate students in all those new programs. One paragraph of his essay should be displayed in full, as a case study in point of view. “As the number of tenured and tenure-track professors has not grown nearly as fast as the output of the labs and research groups they direct, the increase suggests the importance of new methods for increasing output within academe. These include labor-saving technologies, such as more-powerful computer software; the growing importance of cross-disciplinary and cross-institutional collaborations, allowing for enhanced productivity through the division of labor; the growth of the postdoctoral research staff; and the changing norms of graduate-student publication. Many new PhDs have publication records that would have been sufficient for advancement to tenure in previous generations.” And this is good why? For whom? Only for those already within the walls. What you see depends strongly on where you stand to look. This leads to another line of glowing report, that of massive scholarly productivity. Federal R&D spending that goes to universities has tripled in the past fifty years, and major industrial clusters like Silicon Valley and Research Triangle Park have sprouted up to take advantage of the knowledge industries unleashed by academic research. But as Stanford educational scholar David Labaree notes, higher education is highly stratified, and the benefits to research universities are not broadly shared. Yes, the confluence of UNC and Duke and NCSU has spawned Research Triangle Park, but the confluence of Castleton University and Green Mountain College and the College of St. Joseph and a branch of the Community College of Vermont have not equally made Rutland County, Vermont into a venture-capital magnet. That stratification extends even within the slim layer of research universities. That $31 billion in federal R&D investment in higher education research is focused on a handful of institutions, with Johns Hopkins at the top absorbing $2 billion of it all on its own. Over forty percent of federal research grants go to thirty schools nationwide, leaving the other 4,700 in somewhat less fortunate circumstances. Collegiate research, like collegiate football, is only rarely a profit center. Professor Brint also points to the vast swell of scholarly publication. “As of 2014, the Web of Science . . . reached a total count of 90 million records and more than a billion citations.” Well, 90 million divided by a billion is about eleven, not a level of scholarly utility that the enterprise as a whole ought to be crowing about. Again, there’s a vast and unacknowledged stratification there as well. One of my own articles has been cited about 140 times, another five. They just don’t weigh the same, but any aggregation hides as many facts as it reveals. Professor Brint also briefly tries a social-justice argument, one that hearkens back to the traditional value of a liberal education. “The values of universities are also saturating society more fully . . . [h]ow much less would we know about the histories and cultures of minority, female, and LGBTQ students without the academy’s commitment to diversity? These commitments have acquired a moral force that has been reinforced by colleges’ market interests.” Well, one can only hope that’s the case, that higher education actively and daily works to bend the arc of history toward justice. But in the midst of an article largely about how wonderful it is to have research money harvested by grad students and postdocs, how wonderful it is to have a growth in million-dollar gifts, and how wonderful it is to have new programs like fitness and leisure studies, the appeal to social change rings a little hollow. A more rousing focus on justice might include compassion, or even mere recognition, for those that higher education has left by the side of the road: for a generation crippled by a trillion and a half dollars in student loans, for the majority of students who try college (and take on debt) without completion, for the first-generation students at low-tier schools who don’t see rainbows and unicorns in their economic prospects. For the perma-docs shuttling from lab to lab, for the adjuncts shuttling from campus to campus. Social justice, it seems, is something for us to promote rather than to practice. In the end, we may be in the midst not of a golden age of higher education, but in a gold-plated age, a veneer of precious materials covering an uncertain structure. The benefits realized by the permanent faculty at research universities in major metropolitan areas are genuine, but they’re a very partial way of understanding the whole of the ecosystem. The golden age may only be visible to those late in their successful careers, pleased by the gleaming surfaces they imagine they’ve earned, and ignoring the unseen hardships that make their luxuries possible.